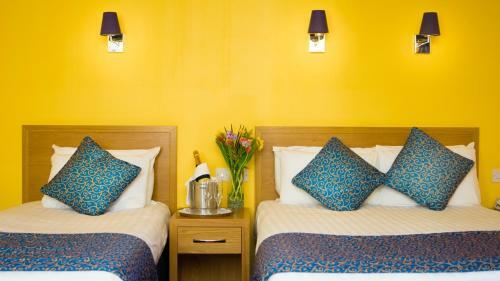 The Celtic Royal Hotel, Caernarfon, Gwynedd hotels with instant confirmed online booking. We have Hotels throughout Gwynedd , Wales . Accommodation near all the attractions, places to see and things to do.......You are able to make an instant secure confirmed online booking. We also offer information on Airports, and travel and tourist information. When children under 16 are using the pool, there must be adults in attendance, swimming at the same time - not just supervising. The pool is available for junior guests from 8:00 to 18:00 daily with last entry at 17:30 and 8:00 to 11:00 on the day of departure. Children are not allowed to use the sauna, steam room or gym. Opening times are as follows: Monday and Friday: 07.00 to 22.00 with last entry at 21.30 (sauna and steam room open between 08.00 and 19.00). Saturday and Sunday: 08.00 to 20.00 with last entry at 19.30 (sauna and steam room open between 08.00 and 19.00). All bank holidays: 08.00 to 20.00 with last entry at 19.30 (sauna and steam room open between 08.00 and 19.00).